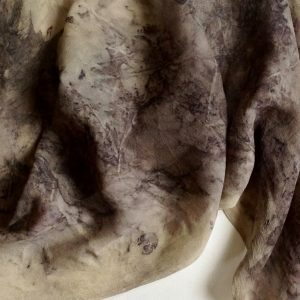 For the past couple of months, I have been busy experimenting with eco printing. 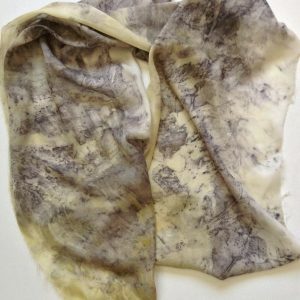 I have also been making and using natural dyes on silk. Last February’s trip to Gujarat was the springboard for this new direction. I am keen to learn about tie & dye and natural dyeing on fabric, after having met some incredible artisans in Bhuj. While I have already been airbrushing on silk, for over a year, I use acrylic paint. 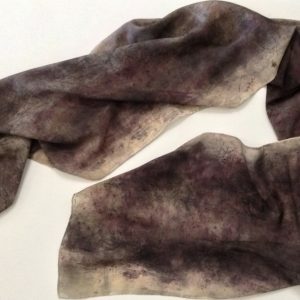 Now, I would like to delve into this world of dyeing with plant material. 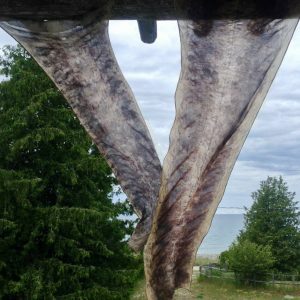 My experiments are being done with guidance from a few books and like minded groups and individuals online, who are also eco printing, and producing/experimenting with natural dyes. The process, while quite simple produces magical results. The silk is first mordanted in a Alum & Cream of Tartar bath. 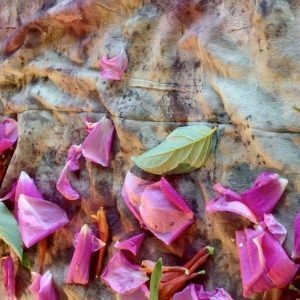 This enables the dye to adhere to the fabric.To print the plant material, I first spray some vinegar mixed with water, on the fabric. Then I assemble the leaves and/or blossoms, dip them in an iron solution and place them on the silk. Afterwards, the fabric is rolled on a large dowel or a branch, tied tightly with string, then put into a steamer. The bundle is steamed for up to 2 hours. I usually remove the leaves shortly thereafter. However, the results are slightly more intense if the bundle is left intact for a day or longer. 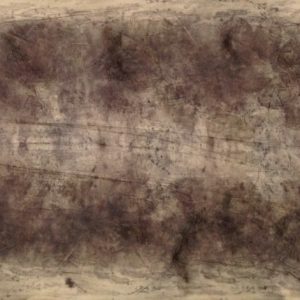 The works on this post are of two different pieces of silk, one of which is Eri silk and the other is Silk Habotai. 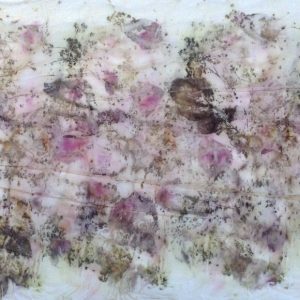 I have used a natural dye of onion skins, prior to eco printing. 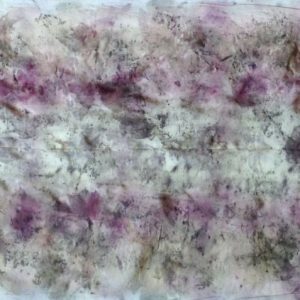 The various plant materials that I have applied on the silk include: the blossoms of Cotinus and Roses, and the leaves of Maple, Dogwood, Jerusalem artichoke, Cotinus and Yarrow. While the results are on the dark side initially, with a mild soap wash and ironing, the colours are brighter and the plant patterns are more distinct. The final product has many nuances of textures and colours.